Sarah Lapp is a dance artist with a physical disability. She holds a certification in Advanced Arts and Entertainment Management from Capilano University and is co-founder of the All Bodies Dance Project. Sarah has relocated to the Okanagan where she continues to invest in the society, and its mission by expanding programming in Kelowna BC. Sarah has attended several workshops and intensives including: Candoco Dance Company Teacher Training (UK) and Stopgap Dance Company Responsive Teaching Practice & Developing Diverse Dance Talent workshop (UK), AXIS Dance Company Summer Intensive and Physically Integrated Teacher Training (California) Canadian Inclusive Dance Teacher Training (AB) DanceAbility Day with Alito Alessi (Oregon), and dance classes with Naomi Brand (BC). In her offstage life, Sarah is a volunteer ambassador for Pacific Assistance Dogs Society and relishes in developing business strategies and supporting innovative companies and projects. 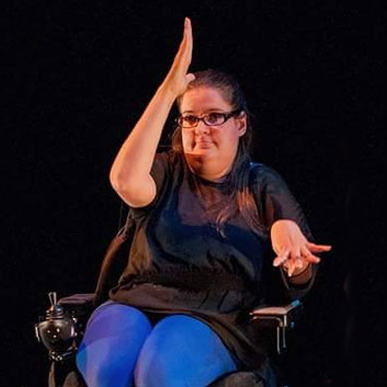 Having experienced the benefits of inclusive dance Sarah strives to empower others to discover the best of their own capabilities through the arts.